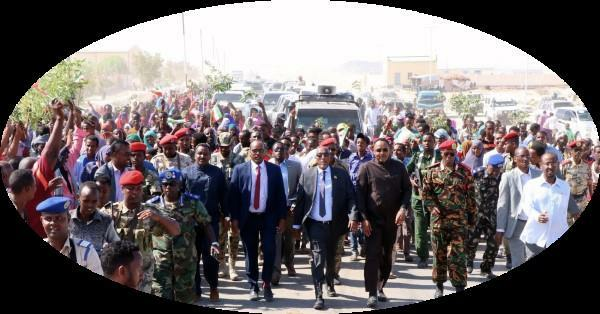 Three weeks short of the anniversary of his first year in office, His Excellency President Musa Bihi Abdi, embarks on a much-awaited tour to Somaliland regions east of the Capital, Hargeisa, for the first time. The President reached the Red Sea port of Berbera, capital of Sahel region, Sunday, where he stayed the night, to meet local officials, traditional leaders, development actors, and take stock of the regional situation in the spheres of security, development, education, health, and infrastructure - among others. President Bihi started to take a closer view of ongoing projects in the region, toured the port where he inaugurated a 24-room, two-hall building administration building, and made a stop at where the 400-quay extension to the existing facilities will begin. "We need not polarize issues of who gets employed at development sites and who should not. Somaliland is bountiful enough for all. We should, however, give precedence to Somalilanders qualified for any opening at hand before looking outwards for someone else to fill it," he stated. The President revealed that his government was working on set quotas for local, unskilled labor in any project so to contribute to area development and yet not prohibit other Somalilander candidates the right to employment wherever they lived or sought work in. "We are working on employment and profit shares to benefit all - local or otherwise. Caustic xenophobia has no place in development planning and project implementation. People who do not have the authority or competence to discourse on issues of national import must stop doing so," he said aiming a dart at any number of be-turbanned instant-authorities who, in recent years, made a habit of staging ‘press' conferences to, more often than not, promote divisive, irascible, rancorous challenges to anybody outside of their immediate circle. This became the norm almost everywhere in Somaliland. Topics only varied, methods remained the same ‘ireful same'. The pResident also visited the ISO-certified oil quality laboratory and the college of marine science, among other places of interest, where he talked to officials, employees, academics, and students, respectively. President Bihi is expected to leave for Burao, Togdheer, in the afternoon.